Burning good dry fuel is essential to keep your chimney running efficiently & safely. The Basics: When we talk about green or seasoned wood we are really referring to the water content. Fresh cut, green wood can have a moisture content of up to 70% & needs to be seasoned until it reaches a moisture content of less than 20%. Burning green wood in a stove will burn very fast, give off little heat & produce large quantities of smoke, tar, soot & ash. It will result in black glass & the possibility of a chimney fire. Make sure you always burn kiln dried or seasoned wood. 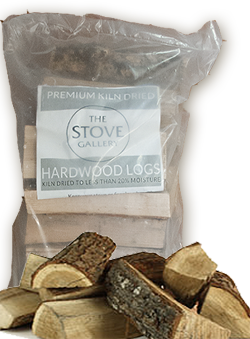 "Good wood gives more heat & less tar in the chimney, the glass stays cleaner & the stove will produce hardly any ash"
We stock a range of Kiln Dried wood at the Stove Gallery - Harrogate. "Get the wood right & you will get a much more heat per log & a very long burn time, better heat convection & a warmer house; resulting in less ash & less cleaning of the stove - meaning less work for you"
Remember always leave a 1-2 inch bed of ash in your stove for the best operation. The reason unseasoned green wood gives off very little heat is that in order to burn, all the water in the wood has to be driven off. This process is called latent heat of evaporation & uses huge amounts of energy. Furthermore green wood will burn 3-4 times faster than seasoned wood as the stove relies upon reducing the air supply to achieve long burn times, with green wood all the vents need to be open to maintain any sort of burning. Lastly the low temperature combustion associated with burning green wood, wastes many of the volatile particles as they are not burnt, they will then condense on the glass & in the flue to produce tar & creosote which will clog up the chimney. In a stove, when burning well seasoned wood you will use as little as a ¼ of the fuel with more than twice the heat output compared to trying to burn green wood. It is false economy buying cheap fresh cut logs & trying to burn them straight away. Different types of wood: All types of wood contain roughly the same amount of energy by weight if all the water were to be removed, so a kilogram of pine will produce as much heat as a kilogram of oak, but of course oak being denser will mean you can fill the stove with more of it & being denser, will burn more slowly. So hardwoods are preferable as a fuel, especially as most log merchants sell by volume not by weight. However hardwoods being denser also take longer to season. People often make claims about the different burning properties from different woods such as ash which is said to burn hotter which is not strictly true, but ash does start off when freshly cut at only about 35% moisture so it way ahead of its cousins when it comes to seasoning & so from a mixed load seasoned for the same period the ash will indeed burn hotter as it will have less water than the other logs. Most merchants cannot specify which species of wood they receive however it will usually be a mixture of different hardwoods. Never burn treated, painted, MDF, chipboard, laminate flooring or indeed driftwood (from the sea) as they will all give off chemicals in the stove which may damage it, & the flue liner, it may also discolour the glass. It will most certainly invalidate the warranty of the stove & liner. Buying from a log merchant: Only about 25-30% of the price you pay comes from the material cost, the remainder comes from the storage, transport & preparation costs, so as a general rule the larger the load you buy, the better value it is. Be wary of 1 tonne bags, this refers to the size of the bag designed to hold 1 tonne of sand, the weight of wood is only a fraction of that. When ordering your wood order the longest lengths which will fit in your stove comfortably, this will enable the logs to be stacked easily & reduce handling. Wood needs to be seasoned for 2 years from felling, so always assume you will need to season wood from the merchant for a further year before burning, no matter what they may claim! We have never found wood from a log merchant ready to burn. Seasoning/storage of wood: To season the wood you are trying to remove the water from within the wood cells, rainwater on the surface is not really a problem so treat your logs like your laundry; you would not try to dry your laundry in the garage or the cellar as it would never dry, you put it on the washing line & on a windy day it will dry in an hour. Wood will take a little longer of course, but store the wood outside or in a well ventilated store in the most exposed part of your garden & you will achieve well seasoned logs. The logs need to be split as the bark prevents the wood drying properly, especially silver birch which will hardly season at all until split. Using a moisture meter (available fromThe Stove Gallery) to test the wood is simple way to check the levels of moisture in your wood, ideally you should be burning seasoned wood when it’s below 20% moisture. Seasoned wood should easily achieve a surface temperature of a stove of 500 °F & should remain that way with the air supply almost closed, if you struggle to get to 300 °F even with all the vents open you have a fuel quality issue. The best way of measuring this is with a stove thermometer (available fromThe Stove Gallery) should you wish to purchase a log store we have a range to choose from. If you have storage problems or are in your first season & have not got a good supply of fuel ready, we have several excellent solutions at hand. Please see our Fuel supplies leaflet & price list. You can pick up from our shop or we can deliver in bulk direct to your door. We have 3 fuel options, why not try a couple of each & see which you prefer. We also have a special discount offer with your first purchase. 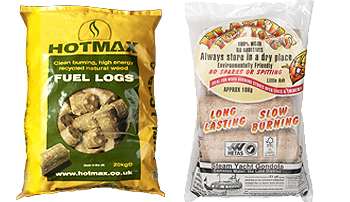 Produced from mixed hard woods, kiln dried logs produces an end product that has less than 20% moisture, for hot slow burning with very little ash. Moisture content is less than 10% so they burn very hot & clean. In our test they burned for over 30 hours. Sold in 10 & 20kg packs which provide the ultimate clean burn with maximum heat output. 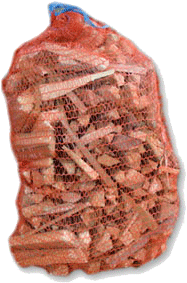 Pre-packed split softwood & hardwood pieces, an essential for getting any fire & fuel started. Not available as a pallet delivery.